If you have got more than one bike in your garage then you probably have a considerable to-do list when it comes to renewing the policies and shopping around for the best quotes. We want to take the hassle out of insuring more than one bike and save you money, which is why we work with a range of insurers to find and provide the best policies for multi bike owners. Whether you require a single multi bike insurance policy to cover all of your bikes or policies that run alongside each other by utilising our mirrored bonus schemes, our team can search for the best policies for you. We search our panel of leading insurers, to get you our best possible price for your motorcycles. What is the mirrored bonus scheme? With the mirrored bonus scheme, the discount you've earned on your no claims bonus, for your main bike will be mirrored onto the second bike. For example, if you have five years' no claims bonus on your first bike, we'll apply five years discount to your second bike. 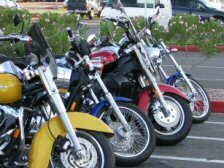 Our multi bike insurance policy is based on the premise that you only ride one of the bikes at any one time, and, as a result, the others are waiting at home, safe and sound, covered by your policy. So whether you use one bike for your daily commute and another for riding at the weekends, we believe bikers shouldn't have to pay high rates for owning several bikes. Talk to our dedicated team about how we can help you find our best policy for you and your bikes. Our multi bike policy rates are only available over the phone. For a quote and to find out if you could benefit from our Mirrored Bonus scheme contact us where a member of our dedicated bike insurance team will be on hand to help you find the right cover for you.